I bought the dark version of Apple Watch Sport 42mm two weeks ago, and had many questions from friends and colleagues since then. As I did when I switched a few years back from the iPhone 3G to a BlackBerry Bold 9700 (yep… but that’s another story), I am going to share here some thoughts about the Apple Watch. I’ve always loved watches. Nice watches. My dream is to have one day an Omega Speedmaster. Since the smartphones have become ubiquitous, a watch is less necessary. You always have your phone with you, which already gives you the time. And a watch is old school: it’s a single purpose device. For many, wearing an Apple Watch will be a switch from not having a watch to wearing one. For me it’s going from a vey nice Tissot to something not wearing the words « swiss made ». Which brings me to the price tag. The quality of finish is really good. I won’t cover that part – if you want more details, read the very detailed review on Ars Technica. On a personal note, I hope matching aluminium armbands will become available from third parties for a decent price. Now the part that I actually want to cover, the software/user interaction side. The first function of the watch is, in the words of my girlfriend, to be « a remote control for the iPhone ». Though it’s correct, it brings other functionalities, but what I think is a new interaction paradigm as well. I haven’t installed a lot of apps on the watch. I haven’t found that many actually. From third party I have Soundhound, Twitter, Evernote, Nike+, AirBerlin and DB Navigator (this last one I haven’t got to work properly). Of these I think the best ones are Soundhound and Twitter – both have a strong usecase for the watch, and work fast. One major issue for third party apps is that in watchOS 1 the logic runs on the iPhone and only the graphic interface is on the watch itself. It will change with watchOS 2 this fall. For the time being it does have major drawbacks: speed, usability when the iPhone is not around and no access to the watch’s sensors. I hope the watchOS 2 will solve that. In the apps from Apple, I mostly use the emails and messages. The preview of emails is actually very usable, even for rather long emails. The message app works great. The contextual answers are often relevant, and Siri works fine – when you are in a situation where you can talk to your watch. The language for both is the language of the conversation. I have set up the watch in French, but if I receive a message in German, the contextual answers are in German and Siri expects me to speak in German. Most of the time it’s just fine, but I’d like to be able to control that – « Siri – switch language to English ». A lot of the added value comes for the fitness capabilities. It has a heart sensor, accelerometer, and it can use the GPS from the iPhone. The heart sensor is precise. I own a Garmin watch with heart sensor as well, and could not notice any significant difference. That’s quite an achievement, because the Apple Watch does not require you to wear a sensor on your torso. The app from Apple works fine, and gives stats about the workout. It does not have advanced feature for running. The Nike+ app is very limited, because it does not have access to heart sensor, and suffers from context switches (I’ll come to this later). It has a lot of value for me. I live mostly in hotels, and I can have a full fitness companion without having to pack an extra watch, sensor and specific power adapter in my suitcase like I did with the Garmin. Now on a more abstract level, I think this new space for software developer is interesting and challenging. It is much more personal than a smartphone. I wear this thing, I don’t want it cluttered with useless apps, it feels kind of my own personal space. I deleted a lot of them which were automatically installed. The interaction paradigm is completely different as well. The interactions are way shorter than on a phone. If I want to use the watch for more than 30 seconds, I take my iPhone. For mails, messages, Twitter – it goes faster to do something on the iPhone if the interaction is longer than about 30 secs. It brings some challenges. The added value of the app has to be delivered in that time. It has to load fast and offer me directly what I need. It has effects on the context switches as well. The Watch goes active when your bring your wrist to sight, and goes inactive after either a few seconds, or if you stop looking a you wrist. If the watch goes inactive and you call it back shortly afterwards, it will bring you back where you were. For instance Twitter will still be open. However it closes the apps automatically after a short period of time when inactive. It makes sense for a short interaction, the user does not have to press the digital crown (« home ») like they would do on an iPhone. On top of that, when you look at the watch, chances are you want to see the time, not where you left Twitter 2 minutes ago. It works mostly seamlessly. But there have been times where the Watch did not behave a I expected it to (app already closed, or on the contrary app still open and I had to manually go back to the watch face). The only real problem I had is with Nike+. It works like a normal app, and does not lock the context like the Apple Training app. I hope watchOS 2 will solve this, because it makes a training app hard to use. The battery life is good on the watch itself. I used it a lot, an didn’t go under 35% after a full day (from 5 am to midnight). It does affect the battery life of the iPhone. I used to leave the Bluetooth off. When I use the iPhone a lot within the day, plus now the watch, it ends up in low in red levels at the end of the day. The USB charge cable is ridiculously long, like if the power plug is in the kitchen and you want the watch on your night desk, Apple got you covered. I like the watch. I see an added value in it, for the Watch Sport model. Though it does not have the romanticism of a mechanical watch. The software is good, but today limited. A bit like iOS was in version 1 good (iPhone OS then!) but became great starting in version 3, I have big hopes for the Watch OS 2. It is a new space for software, with another interaction paradigm. Like the expectations and behavior of a Mac and an iPhone app are different, so is the watch compared to a phone. It will probably take a few month until everyone gets there. Should you buy it? Well, if I were to answer that, I’d probably start a war with AndroidGear fans… Which helps no one. A few point to consider are – I think – the fitness capabilities, the potential for great software, and the easier access to messages when on the go. I think there is a fair case for waiting a well. The software isn’t there yet, and the next version is likely to have major hardware improvements. When I was 7, I was a big fan of Knight Rider (still am). 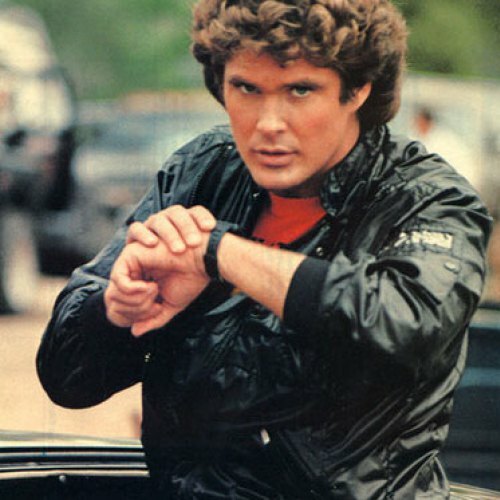 I liked how Michael Knight would talk to his watch, and KITT would come pick him up. I used to try to talk to my Casio watch so that my bike would come. Didn’t work. Now I can talk to my watch. We’re 50% there. If you have questions, I’ll do what I can to answer them!